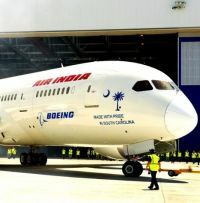 Strange as it may seem it looks very likely that Air India will have the privilege of becoming the first airline to schedule the Boeing 787 into Heathrow. 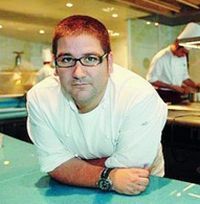 Spain may be going through difficult economic times but that has not stopped Iberia investing in the meals served to its Business Plus passengers. 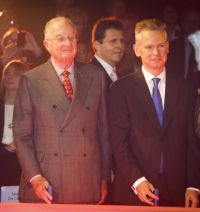 A new rail link connecting Brussels Airport with the high-speed rail network to Amsterdam, Cologne, London and Paris has been inaugurated by King Albert of Belgium. Previously the station was at the end of the line with up to four services an hour to Brussels North, Brussels Central and Brussels Midi stations. Abu Dhabi's flag carrier, Etihad Airways, which is on an expansion spree, has confirmed the acquisition of a 4% stake in Virgin Australia, deepening its alliance with the Australian airline. 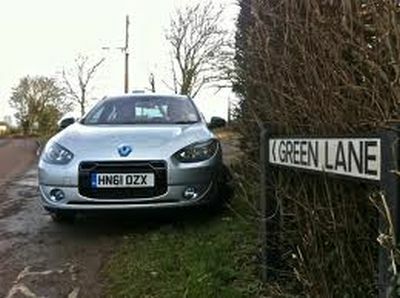 Interestingly it has long been considered a partner for Virgin Atlantic, which also has a financial stake in what was once Virgin Blue. 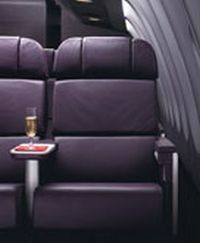 Air New Zealand is another investor in Virgin Australia. 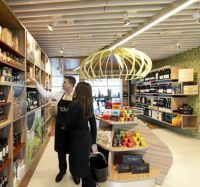 World Duty Free Group has opened two delicatessen shops in Madrid Barajas Airport Terminal 4 under a new brand, The Food Society. The stores cover 53sq m and 147sq m and offer more than 200 Spanish gourmet products. 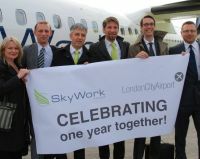 The SkyWork Airlines' service from London City Airport to the Swiss capital Bern is to go three times weekdaily from 29 October, the start of the winter season. There are single return flights on Saturday and Sunday. Boston's Logan Airport has become the first major airport in the United States to offer free transportation to downtown in an effort to cut car travel and alleviate a parking shortage at the fourth-busiest passenger hub in the Northeast. British Airways’ clients should be very careful over the next few months until the merger with bmi sorts itself out. Where routes were previously duplicated, and the bmi sectors remain in place under a BA code, do check which terminal is being used at Heathrow. From Aberdeen you can finish up at Heathrow’s T1, or T5. 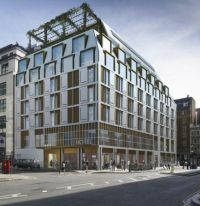 Located just off Finsbury Square between Moorgate and Liverpool Street stations in the City of London the South Place Hotel will open at the beginning of September 2012. The 80-room property offers two restaurants and a rooftop terrace bar. Wi-fi is complimentary. From 11 September onwards Eurostar is introducing a quiet coach facility on-board all its trains for travel from September 2012. As you read BT News today (11 June), IATA (International Air Transport Association) will be holding its 68th AGM at Beijing. 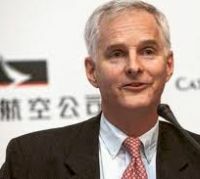 “Beijing is a fitting location for this year’s AGM”, said Tony Tyler, Director General. “It is IATA’s home in North Asia – the location of our largest regional office and largest billing and settlement office, with 132m tickets processed in 2011. But even more importantly, China is a great aviation success story. The government’s strategy of using aviation to drive economic growth has seen China emerge as an aviation powerhouse”. 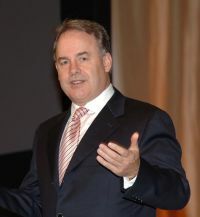 The event brings together some 650 leaders of the global aviation industry. Cape Town is to lose its non-stop South African Airways services to London, leaving British Airways and Virgin Atlantic as masters of the route. 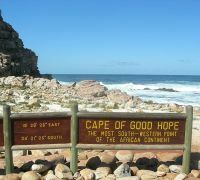 Local tourism chiefs have expressed disappointment and concern about the move. Singapore Airlines’ new medium- to long-haul low-cost carrier Scoot (TZ) has made its inaugural commercial flight from Singapore to Sydney, putting even more pressure on Qantas and other incumbents. The airline operates Boeing 777 aircraft leased from Singapore in a two-class configuration, Economy (including extra legroom seating, branded S-t-r-e-t-c-h seats) and ScootBiz. The seating features 32 ScootBiz seats in a 2+4+2 configuration, with a seat pitch of 38 inches, while the Economy cabin has a 3+4+3 configuration with 31-inch seat pitch. Passengers on all Virgin Atlantic services are now experiencing a refreshed and upgraded dining experience offering restaurant style service. With the dollar now worth around 1.60 to the pound sterling, New York once again offers terrific value for the UK holidaymaker and is well worth considering for either a short break, or even something longer. 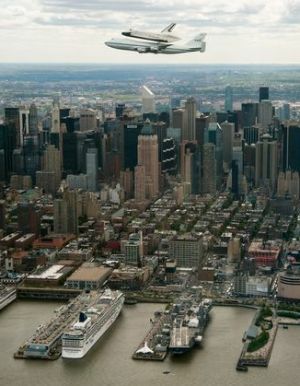 And without doubt the best way is to arrive by sea, either via RMS Queen Mary 2, and her regular summer transatlantic crossings, which offer terrific value, or on one of the many cruise lines who have sailings to and from ‘Big Apple’ particularly in the spring and autumn. 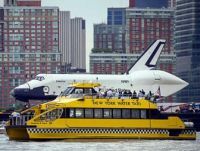 The US Department of Commerce, which is currently very active in its tourist promotion, has announced that 5.4m international visitors travelled to the United States in March 2012. This is a 14% rise over March last year and the 12th straight month of increases in total US visits. With the design frozen next year, a first flight planned for 2016 and deliveries to customers beginning in 2017, Boeing says it is well on the way with the 737 MAX. The aircraft is very much a subtle development of the NG series 737, itself an update of a product that first flew in 1967, 45 years ago. With Farnborough just weeks away Randy Tinseth, Vice President Marketing, has been in London updating the media regarding the new plane. The major airlines continue to fight it out in terms of service and quality offered on board. 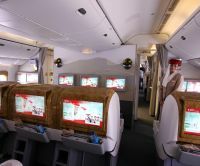 Emirates is the latest to upgrade its ICE (Information, Communication and Entertainment) system, offering a wider and digitally-enhanced screen in all classes on the new Boeing 777 fleet. 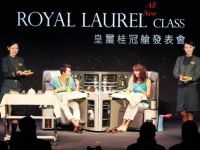 Taiwan’s EVA Air has introduced a luxurious new-generation Business cabin named Royal Laurel Class on its New York service. 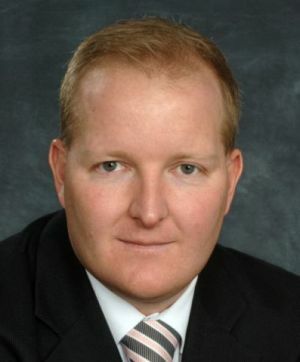 Quickly established in Muscat following the retirement of Peter Hill, new Australian Oman Air CEO, Wayne Pearce, has announced a daily service to the Iranian capital of Tehran from 1 September. 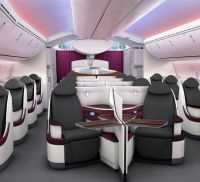 As a prelude to the actual aircraft appearing at the Farnborough Air Show (9-15 July), and its service introduction in September, Qatar Airways is to unveil the exclusive seat design it has chosen for the airline’s Business Class at this week’s Business Travel Market.